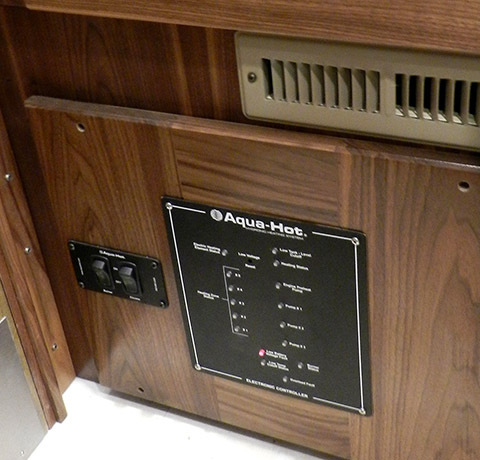 Simple to use, Aqua-Hot hydronic heating systems produce even, moist, fume-free heat and continuous, on-demand hot water. They're renowned for their quiet and efficient operation. Owners of a Born Free RV with Aqua-Hot on board know just how pleasant the warmth can be. Not only does the addition add value to the high-end motorhome, but fits with the overall level of quality one expects from this builder. "I've been installing Aqua-Hots in RVs with different manufacturers for over 20 years," said Jeff Butler, Born Free president. "I know most customers want a more effective and efficient heating system, with unlimited hot water in their coaches." Born Free currently offers Aqua-Hot upon request, but is reviewing adding the system as permanent option. Each of the nine models of Born Free coaches are handcrafted by skilled, experienced technicians. Master joiners build the solid cabinetry at the company's Humboldt, Iowa factory. The molded fiberglass bodies are designed and formed on location. Its website is www.bornfreerv.com. The leader in state-of-the-art hydronic systems for RVs, trucks, buses and other vehicles, Aqua-Hot Heating Solutions builds solutions for diesel, propane and natural gas powered applications. Its 600 Series is the first California Air Resources Board-accepted heating system for diesel motorhomes.